I am wondering if Automator can be programmed to display particular Websites at a specific time of day. Is that possible? Launch Automator and, when prompted, choose iCal Alarm from the template chooser that first appears. Click Choose and in the resulting workflow add two actions: Get Specified URLs and Display Webpages. 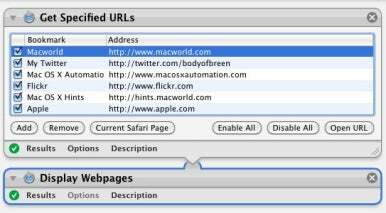 In the Get Specified URLs action, click the Add button to add the names and URLs of the sites you’d like to view. For example, click Add and in the Bookmark field enter Macworld and follow it with http://www.macworld.com in the Address field. Add a couple more sites that you’d like to view. Click Automator’s Run button and Safari will launch (if it’s not already running) and display those sites in separate windows or within tabs in the same window. (Which happens depends on how you’ve configured the Open Pages in Tabs Instead of Windows option in Safari’s Tabs preference.) If the sites open in tabs, the tab order will reflect the order of the sites in the first action. Once you’ve verified that the workflow operates as expected, choose File -> Save. You’ll be prompted for a name for your workflow. Enter it and click Save. iCal will now launch (if, again, it’s not already running) and within it you’ll see a new Automator calendar entry as well as a new event within that calendar associated with the workflow you just created. This is essentially an alarm that triggers the workflow. So, for example, if you want to view these Websites every workday at 5:00 PM, you’d choose Custom from the event’s Repeat pop-up menu and select Monday, Tuesday, Wednesday, Thursday, and Friday. Then enter 5:00 PM in the From area and click Done. Now, every weekday at 5:00 PM, Safari will launch and show you the webpages you requested.